Australian transport and port logistics specialist, Wallace International, received the award for Most Outstanding Contribution to the Group – Oceania, at the World Freight Group (WFG) conference held recently in Hong Kong + expands their Sydney facility. Mark Haeusler (NSW) and Phil Thomas (WA) represented Wallace International at the WFG annual conference. “The award is for all of our team and shows what high regard our level of customer service is held globally,” said Josh Mikkelsen, Wallace’s International’s Manager of Group Development. 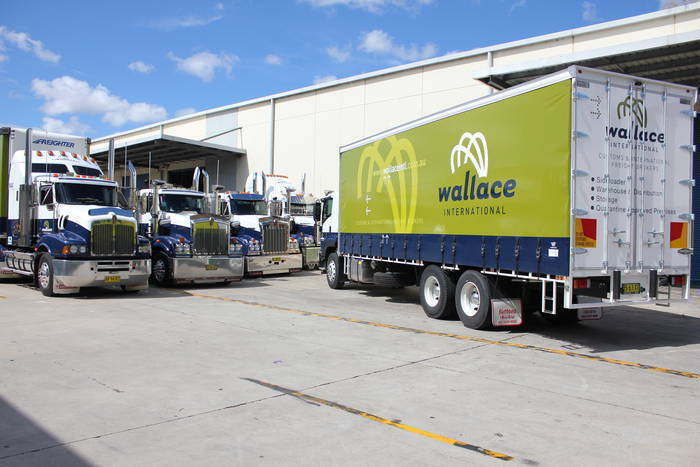 The award comes at a time that Wallace International has continued to expand their Sydney operations. After a long period looking for a larger facility in Sydney, the company was able to take over the property next door to its existing Rockdale premises. The new facility provides 2000 sqm of food quality warehousing + 2300sqm of hardstand, all of it customs & quarantine approved & providing an area for expansion of our trucking & warehousing business but also our special projects work. 600 sqm of modern & renovated office space -(perfect for the right partner wanting Wallace to run their entire supply chain) is also available so you can have your showroom or offices at the front with your own logistics being handled out the back, saving a major commitment & investment in your own people or plant. “These offices will be very handy as we continue to grow organically & by acquisition” said Josh “We know what we are good at & have some of the best people, facilities & equipment in the industry, we are focused on getting the maximum strategic benefit & searching for further niche opportunities moving forward”.